Four Sandhill cranes winged toward the River Raisin. A sparkly hoarfrost coated the short prairie grass, every barren twig and the magenta-colored cedar boughs. A crimson cardinal flitted across the clearing, then landed on one of the autumn olives that grew on either side of the doe trail. Ice crystals drifted from the twig where the cardinal perched. My buffalo-hide moccasins pressed on, carrying me deeper into the Old Northwest Territory of 1792. The sharp hooks of a raspberry switch clawed at a leather leggin, but could not hold on. Frost dusted the linen hunting shirt’s sleeve as the historical me slipped into the cedar trees that cover the east face of the ridge. “Gob-obl-obl-obl! 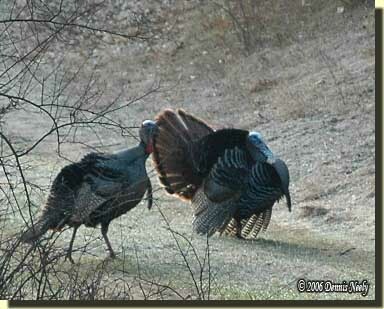 Obl-obl-obl-obl!” The wild turkey tom was a ways down the ridge, maybe even with the south island. My moccasins whisked on with renewed urgency. Fly down would be early that morning. “Gob-obl-obl-obl! Gob-obl-obl-obl!” Two gobblers hollered a second or two apart from across the big swamp, sounding like they were roosted in one of the big oaks that dot the hillside. The doe trail angled uphill, then wandered around a clump of four fallen cedar trees, pulled down by an ice storm the winter before. On the north side of the windfall, two of the cedars formed a small man-sized cove. The portage collar slipped from my shoulders, and I used the leather loop to set the rolled blanket to the left of the opening. With a sigh of relief, I sat, checked the Northwest gun’s prime and then rested the trade gun on my crossed legs. From my lair, it sounded like the two gobblers were standing at the edge of the swamp, near the narrows. A hen appeared about sixty paces to the north of my cedar fort. Two or three more followed; all walked down the hill in the direction of the bantering toms. I knew then there was little chance of enticing the toms with love tones from the wing-bone call. I tucked the creamy white radius bone back in the front of my shot pouch. As I sat mulling over my choices, movement to the left caught my attention. I fought the urge to turn and look, but rather, I squinted to avoid eye contact. Old Lady Gray, a smoky-gray hen with a staunch anti-hunter attitude, walked along the upper doe trail, not ten paces distant. The wary hen looked uphill, then down, then took a few steps to the north. She still-hunted along that trail, then began putting. I knew she had not seen me, or knew of my presence. Something else disturbed her. She putted her way to where the other hens disappeared, and I never knew why she continued to sputter. About the time I lost sight of Old Lady Gray, the gobblers stopped. I sat for a while, then ascended the hill with the idea of circling to the north, sitting in a downed oak top and waiting for the gobblers to begin their mid-day stroll. About ten years ago, a veteran traditional hunter contacted me seeking advice with a problem he had with a new smoothbore. Christopher’s wife bought a 28-gauge, iron-mounted fusil de chasse at the Kalamazoo Living History Show® as a birthday present for him. Chris wanted to hunt turkeys that spring, but he could not get the holes out of the shot pattern. We talked through the loads he had tried, and there was nothing that stuck out as unusual that might cause the holes. The smaller gauge smoothbores can sometimes be problematic when working up a hard-hitting turkey load, but there seemed to be no reason for the blown patterns. One of the loads matched what I would have suggested, so I started with that load as an example. With turkey season on the horizon, now is a good time to think about proper turkey loads. Each smoothbore is different, but a responsible traditional black powder hunter must know what load patterns best in his or her smoothbore. As respectful hunters, we owe a quick and humane kill to the game we pursue. And the only way to achieve an effective load is through range time at the patterning board. The first rule of muzzleloading range time is only change one load component at a time. If more than one component is changed, say the powder charge and the over the powder wad, which is responsible for the change in the pattern? After talking with Chris, I discovered he was changing two components at a time, thinking he was speeding up the patterning. It took some talking, but I finally convinced him to abandon that practice. He was using 3Fg black powder, which burns with a greater breech pressure. Using the starting load, I suggested he increase the charge by five grains, and then ten grains. If he saw no difference, then I suggested that he drop the starting charge by five grains. Pushing up the powder charge beyond the ten grain limit would simply overload the arm. We next plotted a series of wad column changes that covered the standard wad columns favored by competition shooters. This list included lubricated and unlubricated fibered wads and using two .125 cards over the powder with no fiber wad. It is important to keep in mind that turkey hunting usually requires only one shot or two, as opposed to the multiple loading demanded by a sporting clays course, for example. And using the starter powder charge, we laid out a method for adjusting the shot volume. On this subject, I related the difficulty I had patterning my wife’s trade gun. Her shortened chief’s grade smoothbore did not pattern #4 or # 6 shot well, but settled in to consistent patterns for #5 shot. A couple weeks later, Chris called back. He was frustrated with the results. When I asked about changing shot sizes, he simply said “I only have the one bag of shot.” I offered to send him some sample quantities, but somehow that offer turned into helping him at the range. I laid the first three test sheets from that range session on the tailgate and stepped back. “What could it be?” Chris asked. “I don’t understand why the shot is tearing the paper like this,” I said, pointing at the elongated tears that peppered the pattern. “I want you to use my shot and see if it makes a difference,” I said handing a leather shot bag of #5 lead to Chris. While Chris loaded for the next shot, I started circling the funny tears, which surrounded the holes. By mixing the shot that his friends gave him, Chris inadvertently violated the “only change one load component at a time” rule. In essence, he created a Frankenstein shot that would not perform well under any circumstance, out of any smoothbore. By testing a uniform load of one size of shot, his patterning problem was solved, and as he found out with further tests, his 28-gauge performed well with a variety of shot sizes, wad columns and powder charges. Plus that basic load passed a standard penetration test—a tin can placed at the intended maximum distance—too. Spend time at the pattern board, be safe and may God bless you. 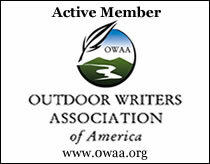 This entry was posted in Muzzleloaders, Turkey Hunts and tagged Dennis Neely, historical trekking, Mountain Man, North West trade gun, Northwest trade gun, trade gun, traditional black powder, traditional black powder hunting, traditional blackpowder, traditional blackpowder hunting, Traditional Woodsman. Bookmark the permalink. I am getting ready to purchase a NW Trade gun kit from Track of The Wolf. It will be a 20 gauge/.62 cal. I know that a lot of different factors come into play but, what can a person expect to be an effective range of a gun like this on Eastern wild turkeys. Ive heard that 20-25 yards is about all you can expect under perfect performance. I’m o.k. with that, as that is where I like to shoot them with a modern shotgun anyway. I was just wondering if you had any advice or could confirm that clean 25 yard harvests are in fact achievable with a gun like this? Thanks and keep up the great work with this blog! The simple answer is “yes,” most smoothbores are effective out to 25 yards with a shot load that is worked up on the pattern board first. “Old Turkey Feathers” was a 20-gauge when it was new 35-plus years ago. The bore now mics .628, which is the standard bore for a 19-gauge–long story there. This question has come up a lot lately, thus I’m going to devote a blog post to this topic in the near future–can you bear with me on this? Thanks and yes! I just got all my parts in for my gun and am very excited to start the assembly so it will be a while before I get to start working on a specific load for it. Thanks again. Good story I use my brownbess with just felt wads and never got great patterns, here In Ca,we are being forced to use nontoxic shot,having a smooth bore I tryed plastic wads for steel shot and was happy to get nice patterns at 25yrds.This is only because of the new laws here!The wads protect my bore and make me legal for future hunts.Running Bear. Be careful with the plastic wads. It is my understanding that modern plastic shotgun wads will melt and leave “strings” in the bore. Some of the suppliers used to make plastic wads made for use with black powder. You might consider bismuth shot. 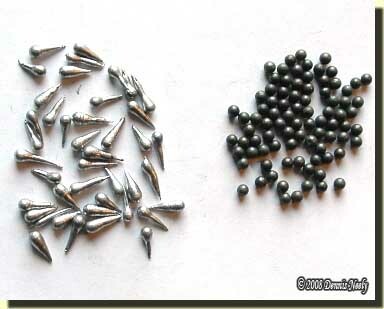 The weight is close to that of lead, so you load about 10% more than lead. When I use bismuth, I load it just like lead, using leaves and grass for wadding. The plastic wad is not needed with bismuth. Mr. Neely you are correct. I used Winchester AA brand shot cups with both BP and Pyrodex, and it was incredibly tough to get that melted plastic out of the barrels of the guns. Important history fact…Hoppe’s #9 was originally made with Benzine, but it has been removed because benzine is carcinogenic. Now benzine vs. the first generation of plastic shot cups (when BP Shells were still being made and the early cordite based powders were still used) dissolved that plastic in one pass of the cleaning rod mop. 😀 It was a miracle! Over time the plastic got a bit tougher to melt, and the smokeless powders were not so hot, and BP shells pretty much disappeared from the market….so the lack of the benzine in the Hoppe’s didn’t effect its rep. Luckily a friend’s father had given me some Hoppe’s #9 with benzine added (the father was a commericial chemist for 35 years) with the admonition to use it only out doors when nothing else will clean the barrel. Well, it worked on the plastic in the bores. I was lucky as several hours and steel wool and bronze bore brushes were not getting the job done. That is very interesting. I’ve never used plastic in my bores and only used commercial black powder solvents for two seasons in the early years of my traditional black powder hunting odyssey. Unfortunately, I know of several people who have spent hours trying to get a bore clean. It is not a fun job. Thanks for the education!